Are you looking for a powerful, compact air conditioner for a larger home office or computer room? The Black and Decker 14,000-BTU portable AC might looks deceptively small. But it is really powerful - it can quickly cool a room of 550 sq. ft. or heat one up to 200 sq. ft. This portable unit is ideal for larger rooms like your living room, home office computer room or media room. It costs less than $500, too. 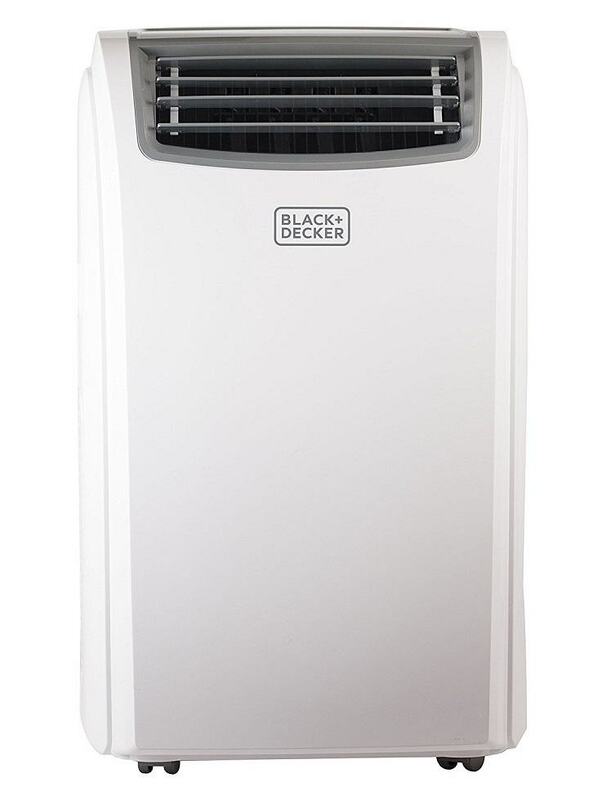 Keep reading for my full review of this excellent Black and Decker portable AC, below. 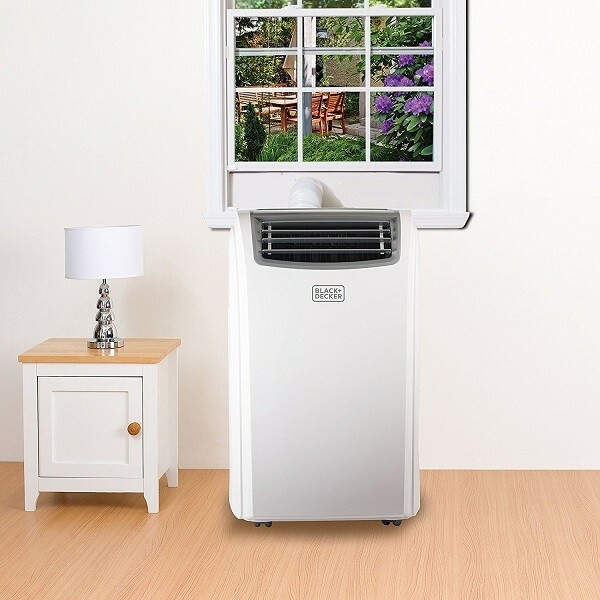 If you are looking for a less powerful (and cheaper) 12,000 or 10,000 BTU unit, see my guide to the best portable air conditioners of any size. 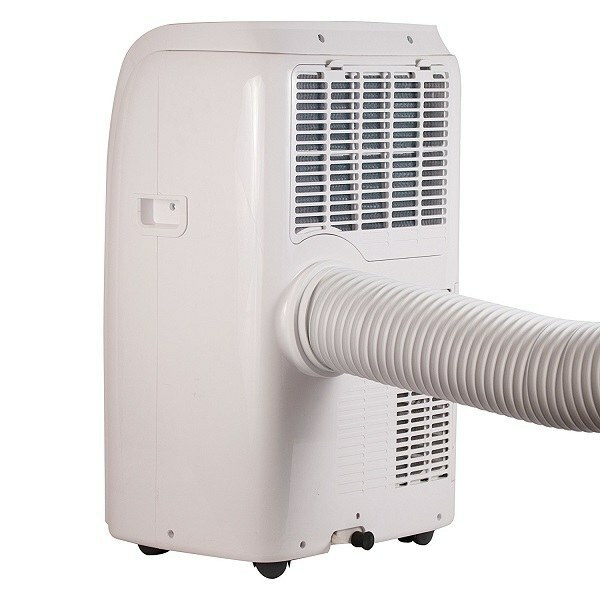 Includes heat and dehumidification functions. This AC is a beast. It looks small but packs a lot of power. It has a cooling capacity of 14,000 BTUs and a heating capacity of 11,000 BTUs. The recommended maximum area for cooling is around 550 square feet, which is ideal for mid-size and large rooms. It’s also great for open concept living areas. The recommended maximum area for heating is around 200 square feet. This is perfect for bedrooms, home offices, and nurseries. Cool –This is the standard cool setting. To use it, first make sure the unit is in Cool mode (it’s the one with a snowflake image). Use the arrow buttons on the control panel or remote control to set your preferred target temperature. The recommended temperature range in Cool mode is 64F to 95F. Heat –This mode warms up the air in the room. Just select the heat mode (shown by the sun image) on the control panel or remote control and then set your desired target temperature. The recommended temperature range in Heat mode is 50F to 77F. Dehumidification –This is the DRY mode. It takes out excess moisture from the air and exhausts it outside through the window vent. In this mode, the fan speed is set automatically, and you cannot change it. Fan – The FAN mode operates just the fan at the speed you set. It’s ideal when you only need mild cooling. 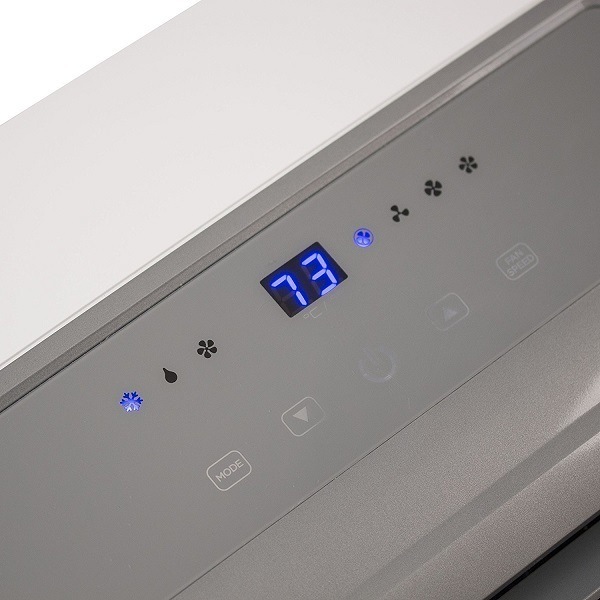 In cool and heat modes, you can change the fan speed to boost performance or reduce the noise level. The remote control includes buttons for several other modes, too. There is the Max function for rapid cooling, Sleep mode which automatically regulates temperature for a comfortable night and an Air Swing mode to control the direction of airflow. 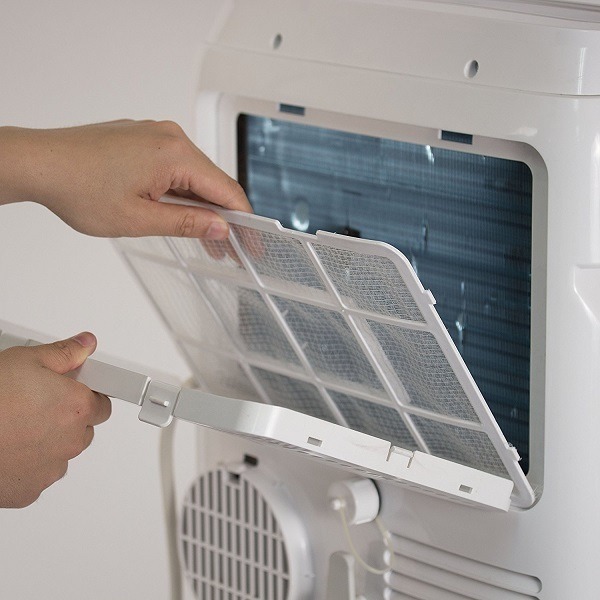 This is a self-evaporative air conditioner, meaning it exhausts moisture outside. The drain hole at the bottom is closed with a plug to prevent leaking. If there is too much humidity in the room and the evaporator can’t exhaust all the water outside, them it will indicate that the water receptacle is full and stop operating. Open the drain hole and drain the water manually using a hose to get it working again. We like that the drain hole is plugged. This solves a common leak problem in many self-evaporative portable ACs. The unit comes with a large filter that easily slides out from the back. A quick rinse under the tap is enough to clean it. You can reuse it many times before you need to replace it. The unit has a nice looking LED control panel at the top. LED lights appear under various symbols to show you what setting is active –snowflake in cool mode, sun for heat mode, water droplet for dehumidification and so on. The remote control has extra functions including a 24hr on/off timer, sleep mode, max mode, swing function and an F to C button. For a 14,000 BTU AC, this Black & Decker AC is really compact. The downside is that it works very hard and makes a bit of noise as the fan spins. The upside is that it doesn’t take up much space and is easy to move around. With the caster wheels on the underside, you can easily move it from room to room depending on your air conditioning needs. Other than the high price tag (which is to be expected considering it’s a 14,000 BTU AC), the biggest issue with this model is the maintenance. One customer noticed that even a small obstruction on the vents could cause the fan to malfunction. You need to open and clean the unit daily if you use it every day. You also need to remove the filter and rinse it often. But the extra work is worth it. It cools a room down better and faster than most portable ACs. It also makes noise. If you plan to put it in your bedroom, select the lowest fan level to reduce noise. If you have a large room or a space that gets hot (e.g., computer/gaming room), this is the best portable AC we've reviewed. As a bonus, you don’t have to turn it off in winter. Just set the mode to heat, and you can enjoy it all year round.